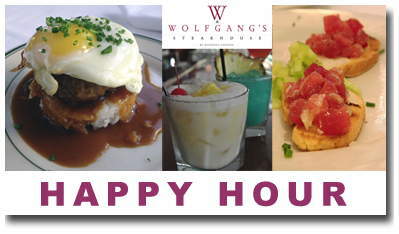 General Manager of Wolfgang's Steakhouse by Wolfgang Zwiener in Waikiki, is pleased to announce that the restaurant has extended its popular Happy Hour - called "Cocktails on Kalakaua" - from 4:00~6:30 p.m. to 11:00 a.m.~6:30 p.m. daily, in the bar area, only. "Our Happy Hour has become an institution in Waikiki with many locals coming in more than once a week," said Nickerson. "We decided to make our Happy Hour a little HAPPIER with longer hours so more people can enjoy it! Our Happy Hour has been growing in popularity with our East-bound and West-bound visitors, as well, so it's been standing-room-only. Now we can accommodate people who prefer to come a little earlier." Wolfgang Zwiener, a veritable icon after over four decades of loyal service at the legendary Peter Luger's in New York, is a craftsman in his own right. Building a solid reputation on the strength of his service and exacting standards, Zwiener hand selects all sides of beef served in his steakhouses, and chooses only USDA Prime Grade Black Angus beef for superior marbling, tenderness, flavor and texture. A ritual with an artisan's flair, the sides of beef are dry-aged on site to perfection, and then carved to order by our own butcher into Wolfgang's signature Porterhouse, prime New York sirloin, ribeye, filet mignon, and prime rib. The results are luxurious -- meltingly tender and juicy steaks served sizzling hot with a perfectly caramelized crust. Wolfgang's menu has something to please every palate with their famous mouth-watering steaks, and other excellent entrée selections including veal, lamb, wild king salmon, Chilean sea bass, sushi grade tuna, three-pound lobsters, and more. For their Waikiki location, rice has been added to Wolfgang's classic side offerings like creamed spinach and German potatoes. Tempting appetizers such as shrimp and lobster cocktails, fresh oysters on the half shell, thick, sizzling bacon, and crisp, fresh salads are the perfect prelude to any main course. Solid American walnut floors, wenge wood wainscoting, solid mahogany bar, a beautiful 30-foot custom-designed glass ceiling, imported Italian chandelier, and mosaic tiles created by famed artist David Inbal of Israel, which pay tribute to the Guastavino-tile vaulted ceiling in the flagship Wolfgang's Steakhouse in New York, set the classic ambience for the perfect New York-inspired fine-dining experience, right in the heart of Waikiki. Guests may also choose from a huge selection of wines in our award-winning wine cellar, or enjoy their drink of choice from the bar. Two private rooms for parties may be reserved in advanced, and can be combined to accommodate up to 100 people. The rooms feature sophisticated décor, as well as 50-inch flat panel televisions and full A-V capabilities, which is ideal for special events and meetings. Wolfgang's Steakhouse's regular hours are Sunday through Thursday, 11:00 a.m. to 10:30 p.m., and Friday/Saturday, 11:00 a.m. to 11:30 p.m. We offer lunch, happy hour and dinner daily, as well as an excellent weekend brunch menu on Saturday and Sunday. Royal Hawaiian Center offers the best parking promotion in Waikiki! The first hour of parking is free, then $1 per hour for the next three hours, with validation. Regular rates apply after the fourth hour.